Alligators and crocodiles have formidable jaws that snap closed with enough force to break the bones of even the largest animals. A human can tear into a steak and generate between 150 and 200 pounds per square inch of force. In comparison, the largest crocodilian species can generate nearly 19 times that amount of force when they eat. In a study led by professor Greg Erickson of Florida State University, the bite force of crocodiles and alligators was tested by placing a measuring device similar to a tuning fork between their teeth. A gauge attached to the device gave the scientists readings of the animals' bite force in psi. The American alligator clamped his jaws around the device exerting an average of 2,980 psi and ranked fifth overall in terms of bite strength among the species tested. In comparison, animals such as hyenas, lions and tigers bite with a force around 1,000 psi. Erickson performed bite tests on all 23 species of crocodiles including numerous 17-foot-long saltwater crocs, Nile crocs, caimans, gharials and alligators. The winners of the bite force challenge -- saltwater crocodiles -- clamped their jaws around the bite sensor with an astonishing 3,700 psi of force, the strongest bite of any living animal. The bite force of the Tyrannosaurus rex has been estimated at 12,814 psi and the estimated bite force of the now-extinct "limousine crocodile" was estimated to be 23,100 psi, nearly twice that of the formidable T. rex. In other animal species, variations in bite strength correlate with varying jaw shapes, sizes and tooth forms. In crocodilian species, though, Erickson and his colleagues discovered that bite force strongly correlates with body size, despite variations in jaw shape or size. Based upon the results of Erickson's tests, he explained that if you scale the results from the tests on the 17-foot crocs up to a 20-foot croc, his bite would generate a whopping 7,700 psi of force. While testing the bite strength of alligators and crocodiles might not be for the faint of heart, one of the scientists involved in the study said the most difficult part was getting the creatures to give the bite bar back. Some would hang on for up to 20 minutes before releasing their deadly grip on the instrument. 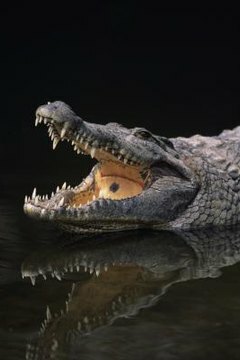 In a similar study conducted at the University of Florida in 2003, the reigning bite champion was an American alligator named Hercules. At 12.5 feet long and weighing in at 665 pounds, his bite force was measured at 2,125 psi, giving alligators their moment of glory. It wasn't until the following study was conducted in 2012 that the saltwater crocodile was able to dethrone Hercules and the American alligator as bite force champion.